One of those things is not like the other. All but one of these define a person. Somewhat contrarily, the focus of this article will not be Turing’s sexuality. Instead, I will make the point that your sexuality does not define you, rather your achievements. His sexuality, and the unfortunate consequences, are arguably irrelevant. Turing was instrumental in the development of theoretically based computer science. He was not well known for this during his lifetime, although he is much more widely recognised in the modern day. With his ‘Turing Machine’, which can be considered a model of the modern personal computer, he provided formalisation of the concepts of algorithm (defined as a process or set of rules to be followed in calculations or other problem-solving operations) and computation (now defined as the action of mathematical calculation). During his early life, Turing was far ahead of the school system and so studied advanced mathematical and scientific concepts on his own. Also at school, he was profoundly affected by the sudden death of a close friend, Christopher Morcom. It has been said that this was part of the inspiration and drive for his later success. Turing published a paper in 1986 now widely recognised to be the genesis of modern computing and computer science. Within the paper, he suggested the use of a ‘universal machine’ to perform procedural tasks. Only a decade later, he would transform this revolutionary idea into a practical electronic computational machine. He and his algorithms also played a crucial role during the Second World War, the achievement for which he is most widely recognised. 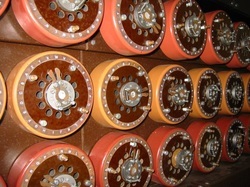 After September of 1949, Turing and other mathematicians at the GC&CS (Government Code and Cypher School) housed at the well-known Bletchley Park, fashioned a machine to break signals encoded by the famous Enigma machine. The computational device he developed was capable of breaking the coded messages on an industrial scale, changing the course of the war significantly. It is estimated the breaking of Enigma shortened the war by two to four years. In 1951, Turing turned his attention to a totally different scientific problem - the issue of understand the biological patterns - petals, spots, stripes etcetera - within nature. In a paper still widely regarded as a classic, he proposed a chemical interaction based explanation and developed equations for it. For this, he was elected a Fellow of the Royal Society. Turing committed suicide on 7th June 1954 after a conviction for gross indecency for homosexual acts. This conviction led to the revoking of his security clearance, harassment by police surveillance (because he was considered to be a security risk) and forced chemical castration. He was finally granted a posthumous royal pardon for this in December 2013 after a campaign supported by the likes of Stephen Hawking. He was an unfortunate victim of the attitudes of the time, which most of the modern world now recognise to be unjust.